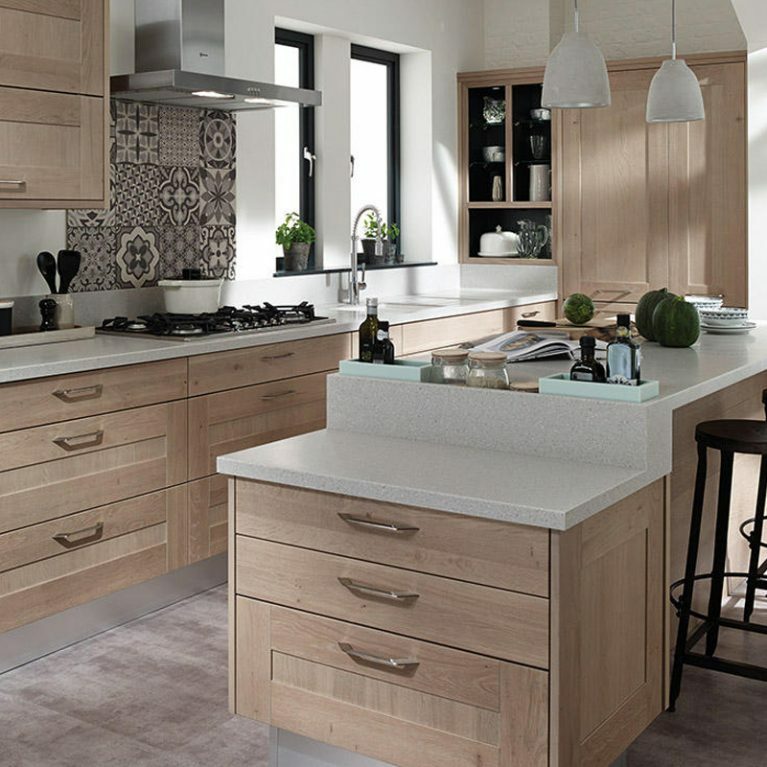 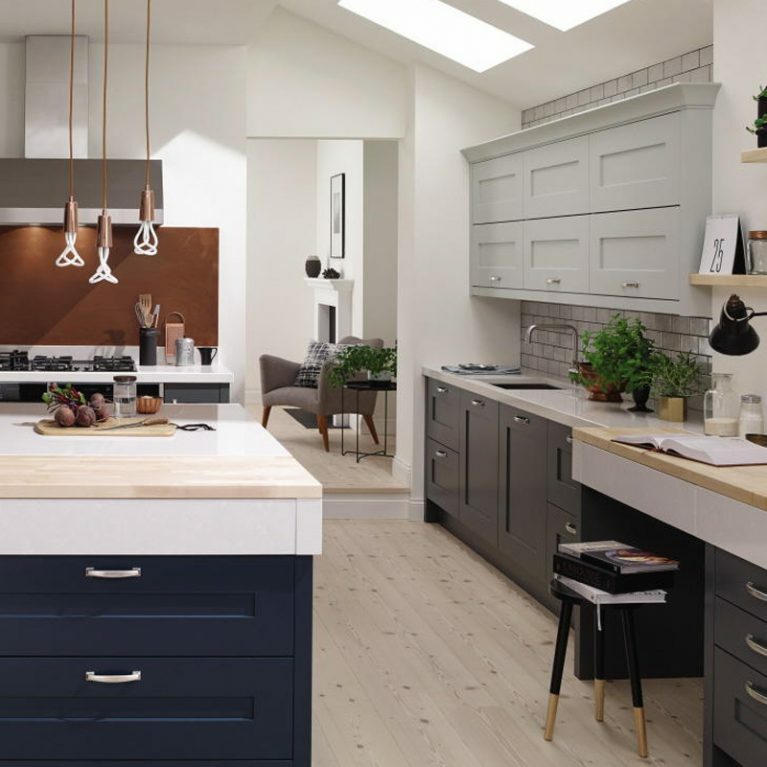 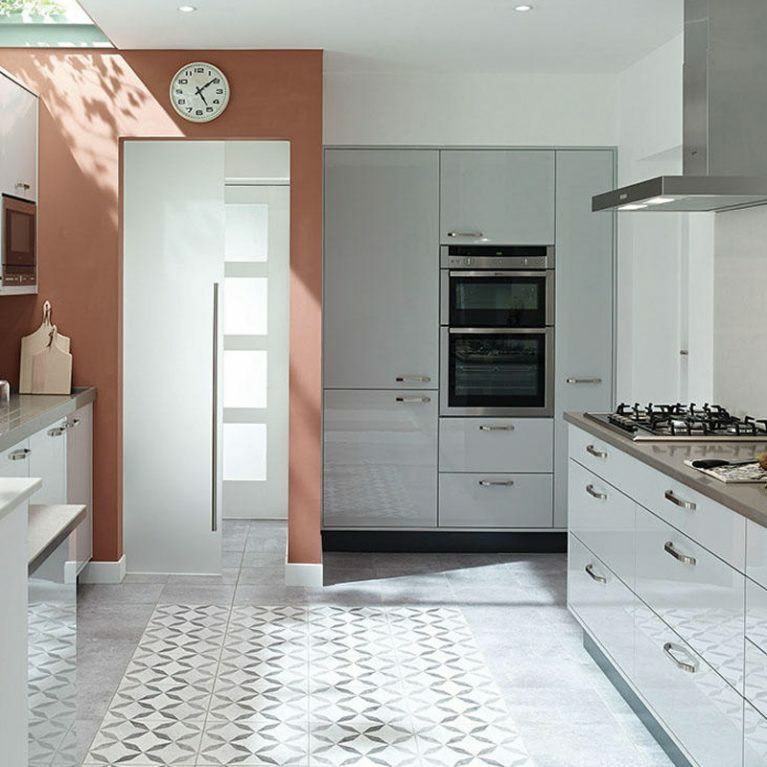 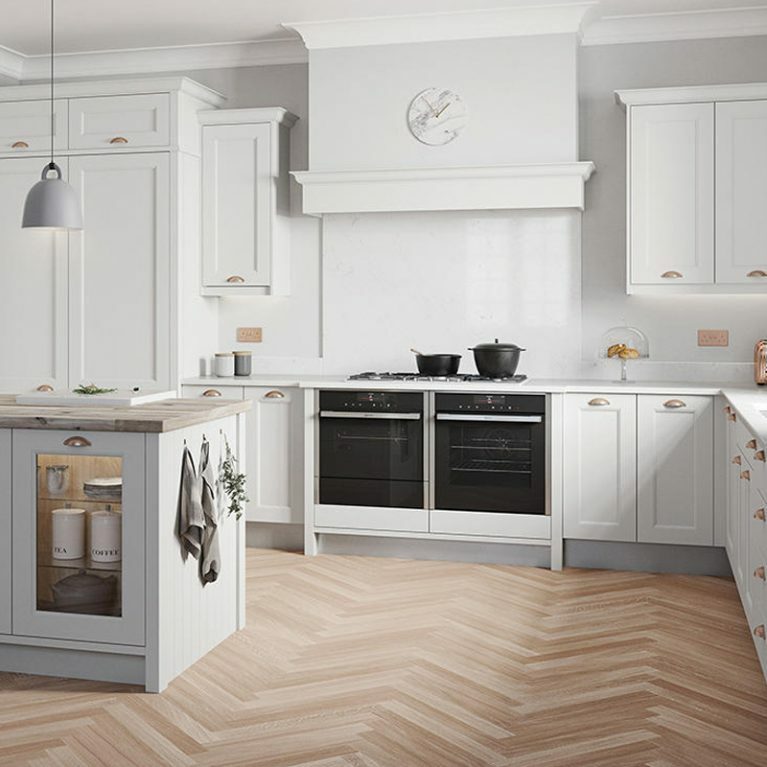 Oak is a classic material and colour palette regularly utilised in kitchen designs, and taking one look at the beautiful Milton Oak kitchen will prove why this has been the case for many years, and will certainly continue to be the case. 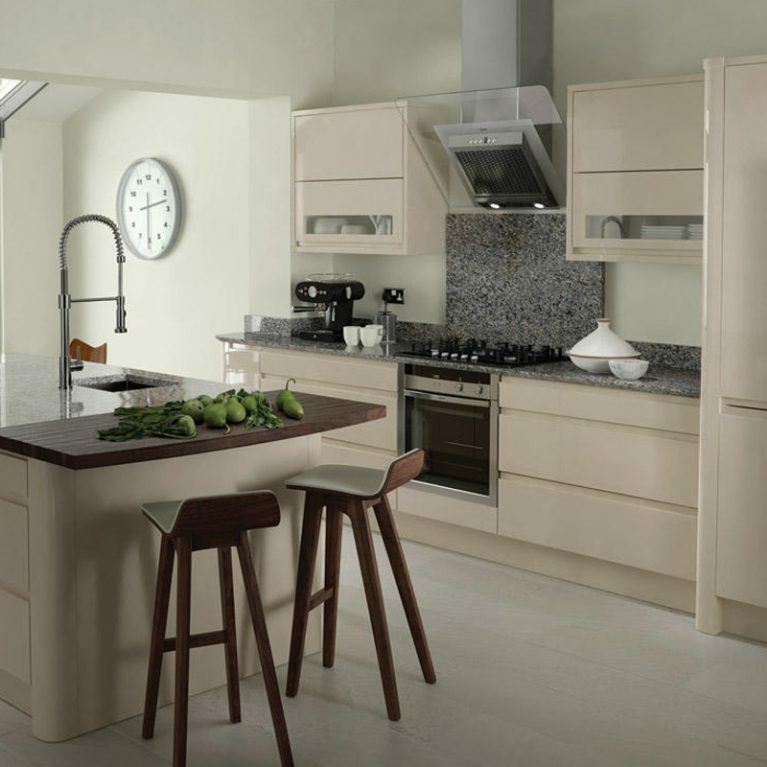 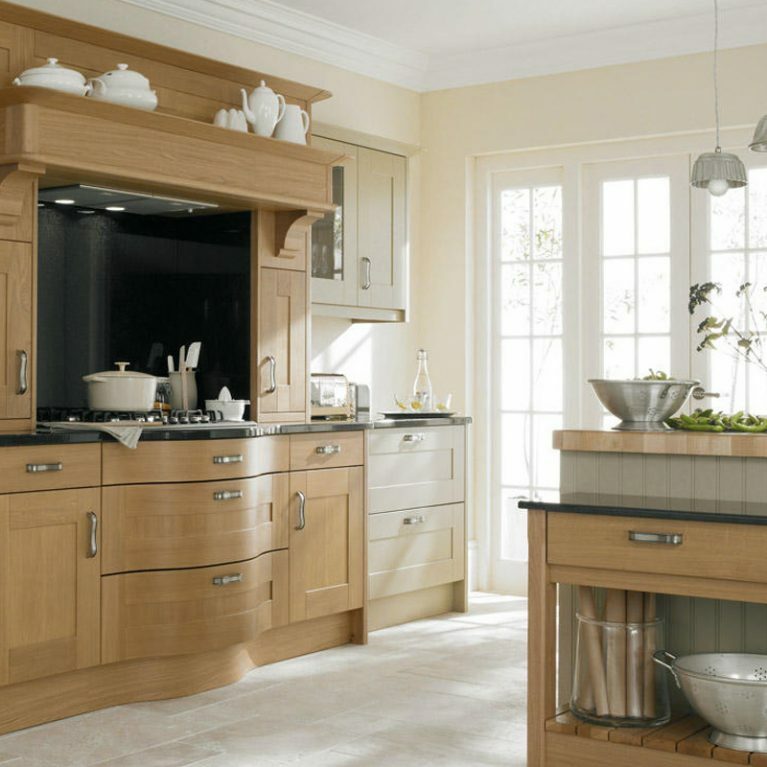 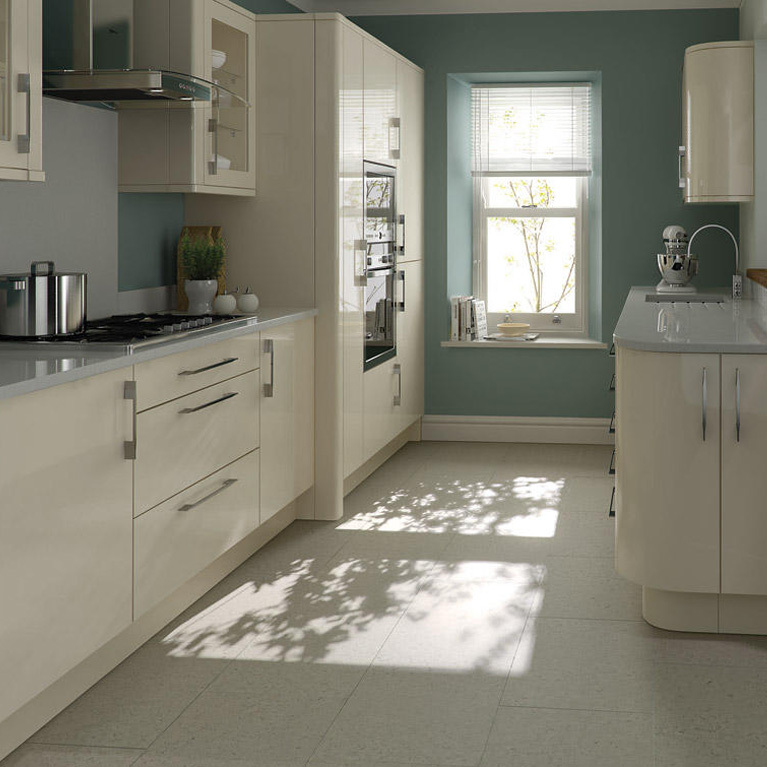 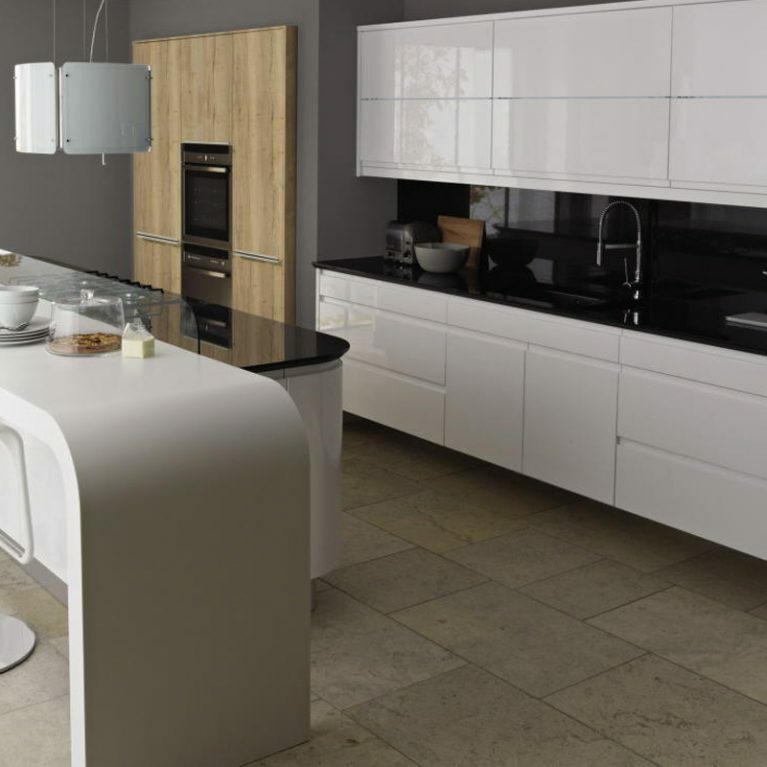 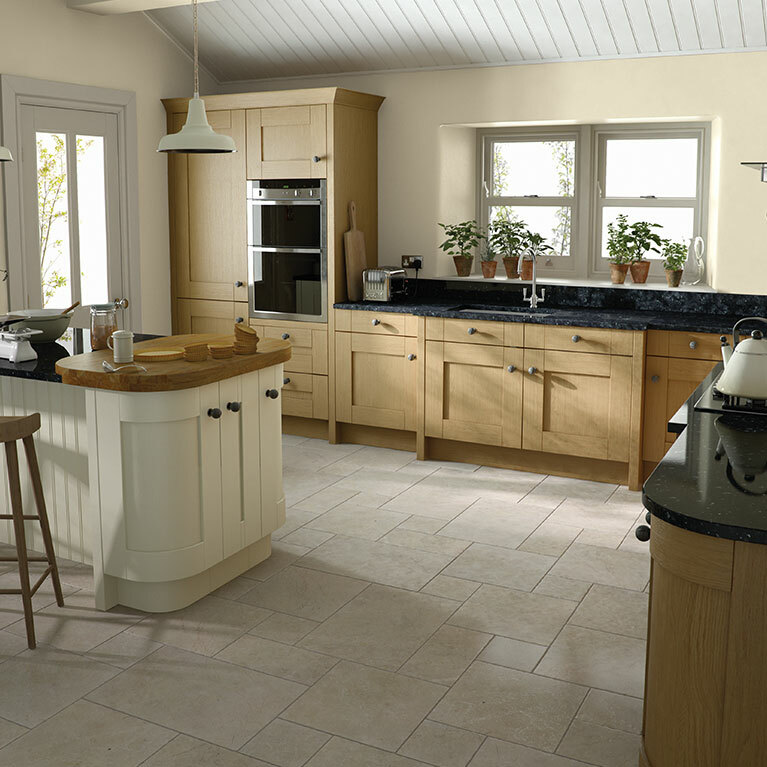 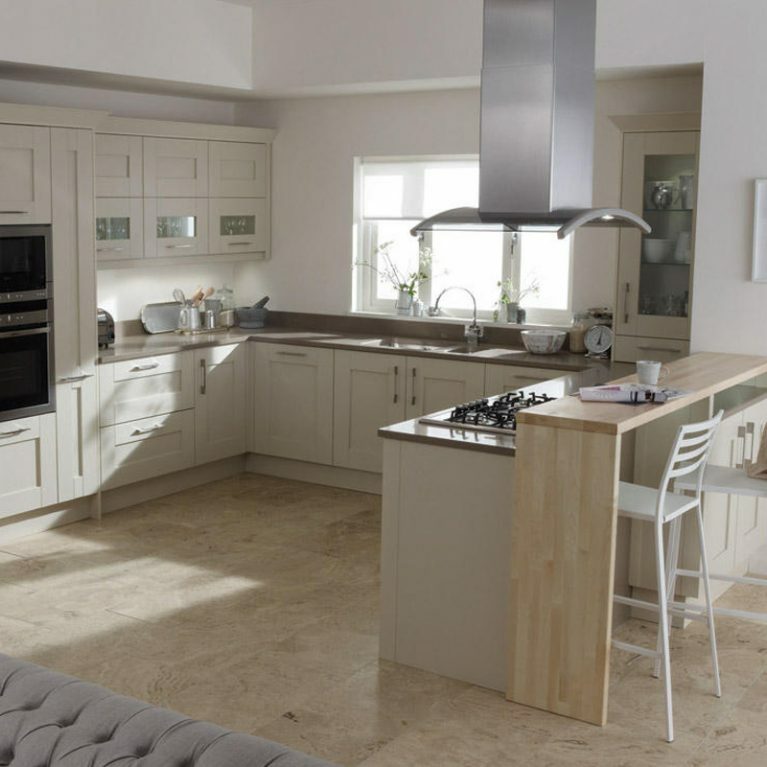 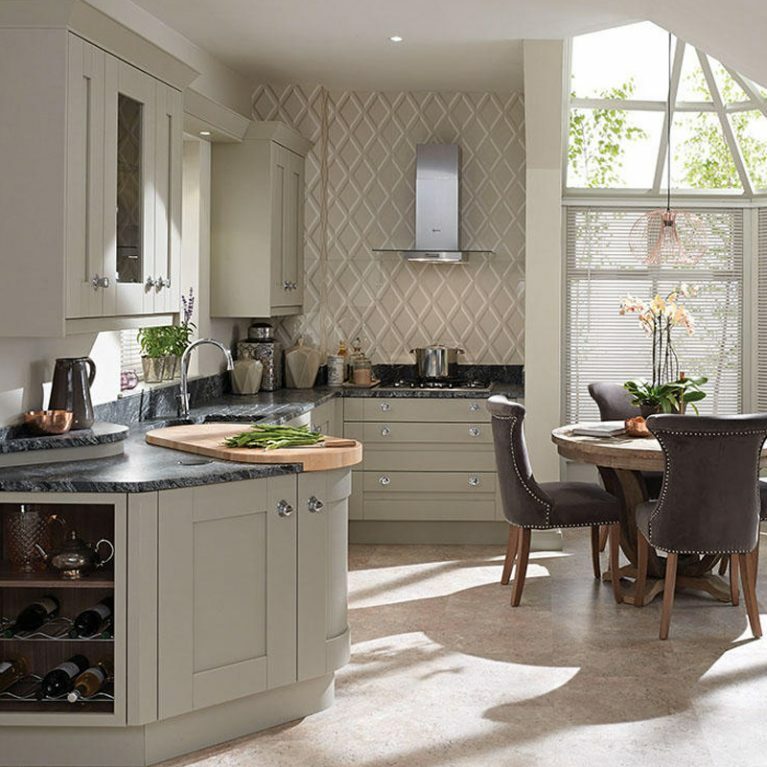 The Milton Oak classic curved wood kitchen is the perfect specimen of a kitchen design. 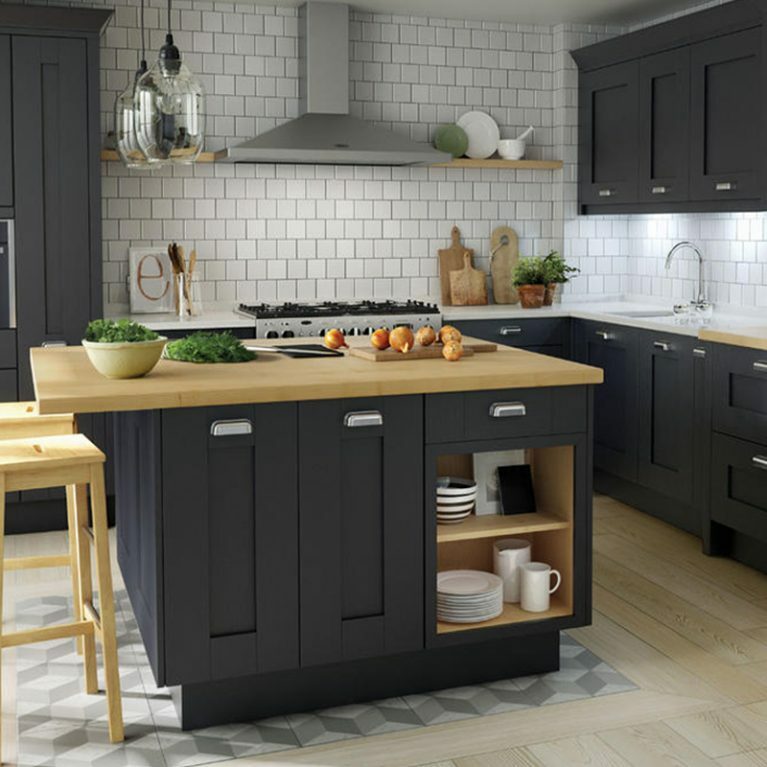 Crafted in a classic shaker fashion, this beautiful wood-effect kitchen offers a plethora of storage solutions within your kitchen space, ensuring that everything has a home. 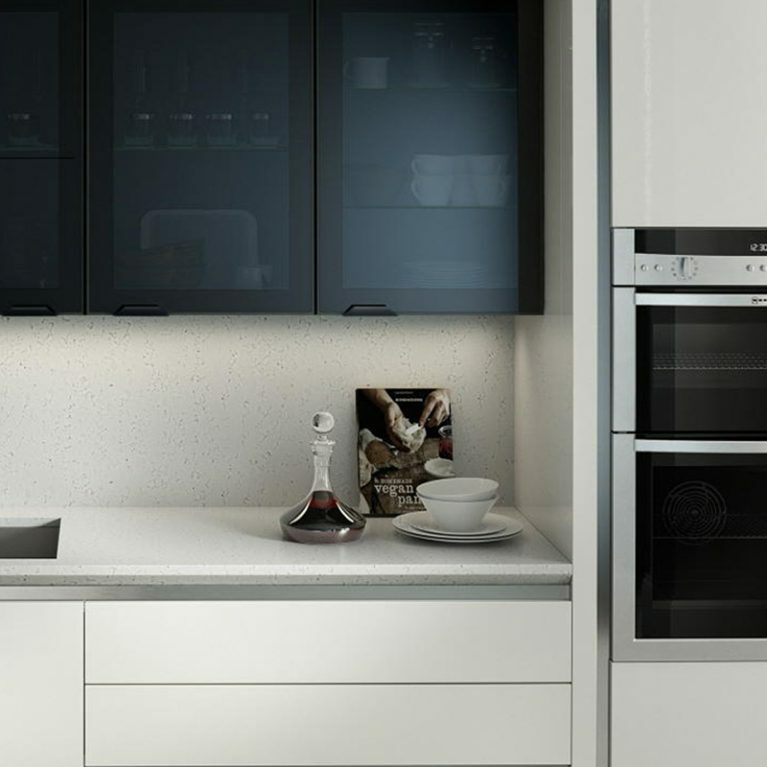 What’s more impressive, is that it offers a remarkable amount of storage whilst keeping the design clean, smooth and flawless. 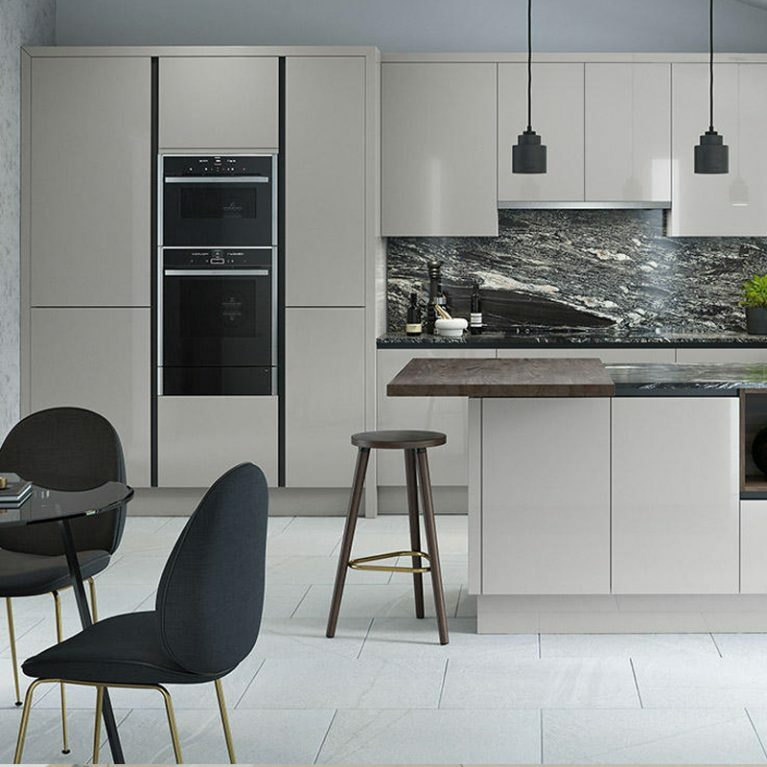 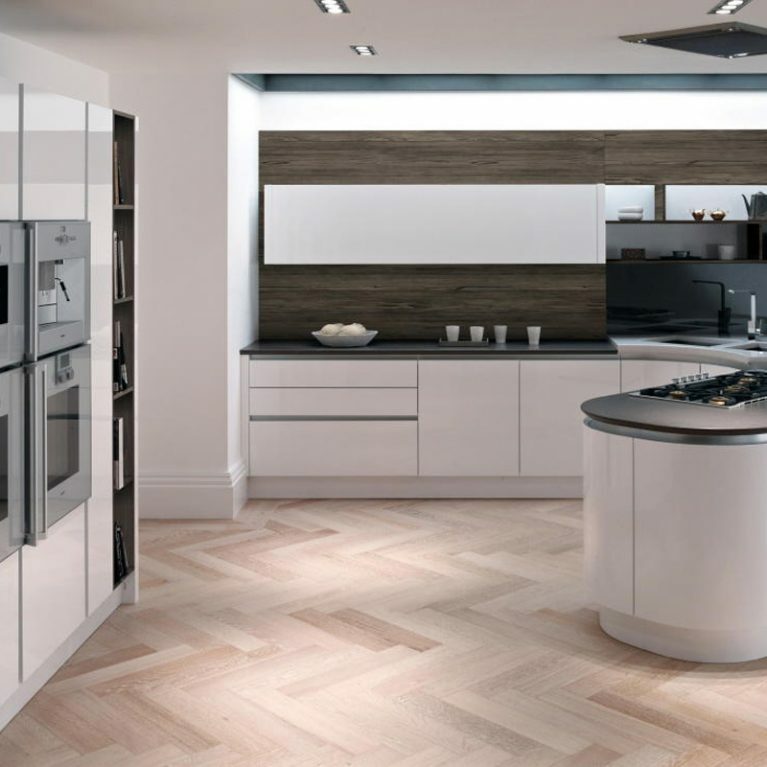 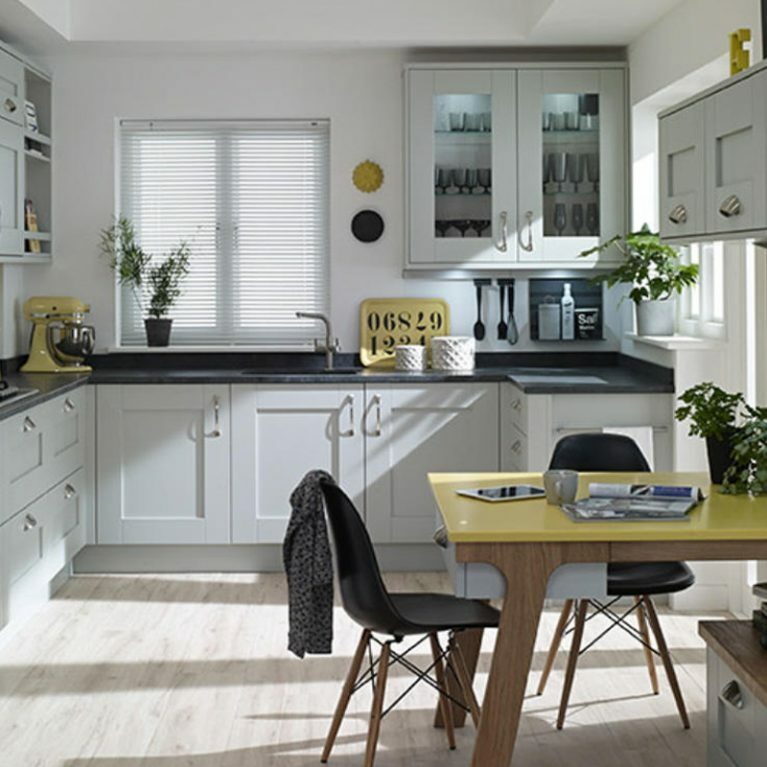 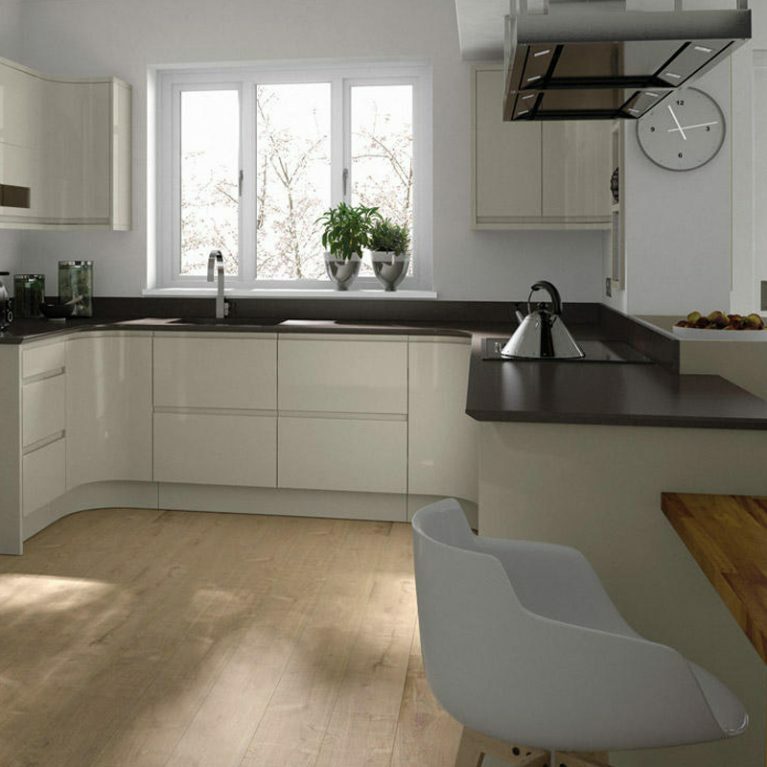 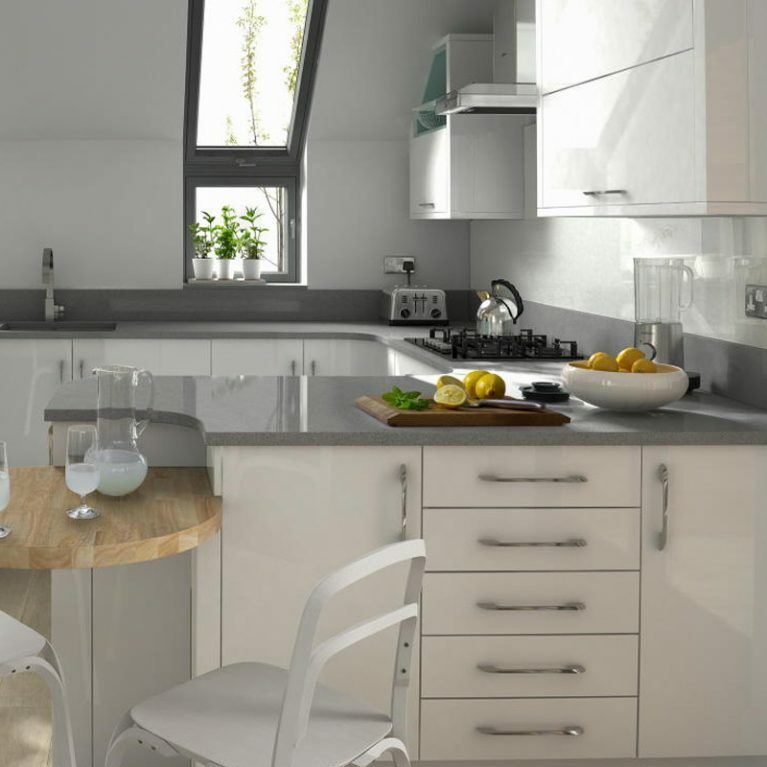 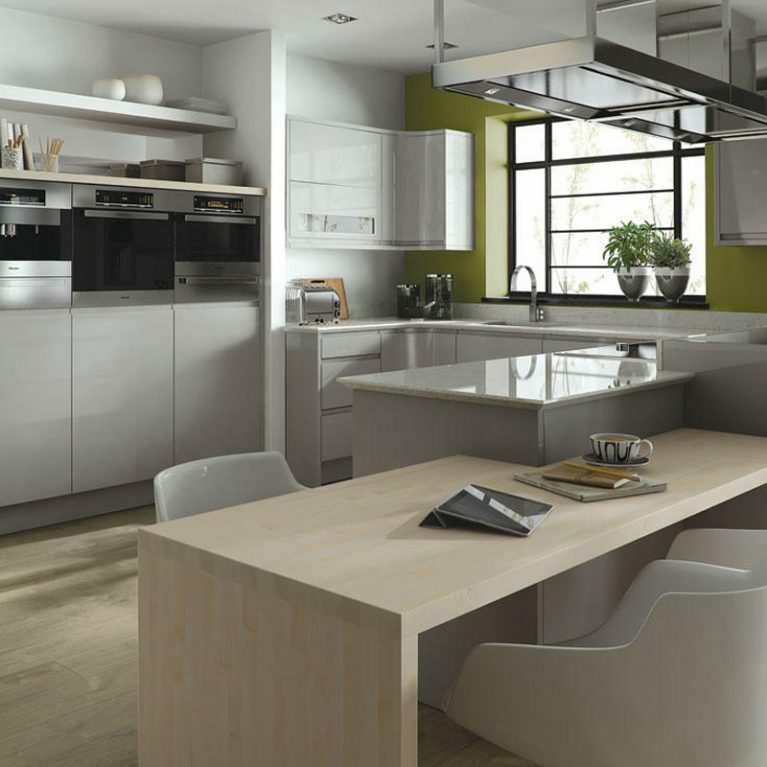 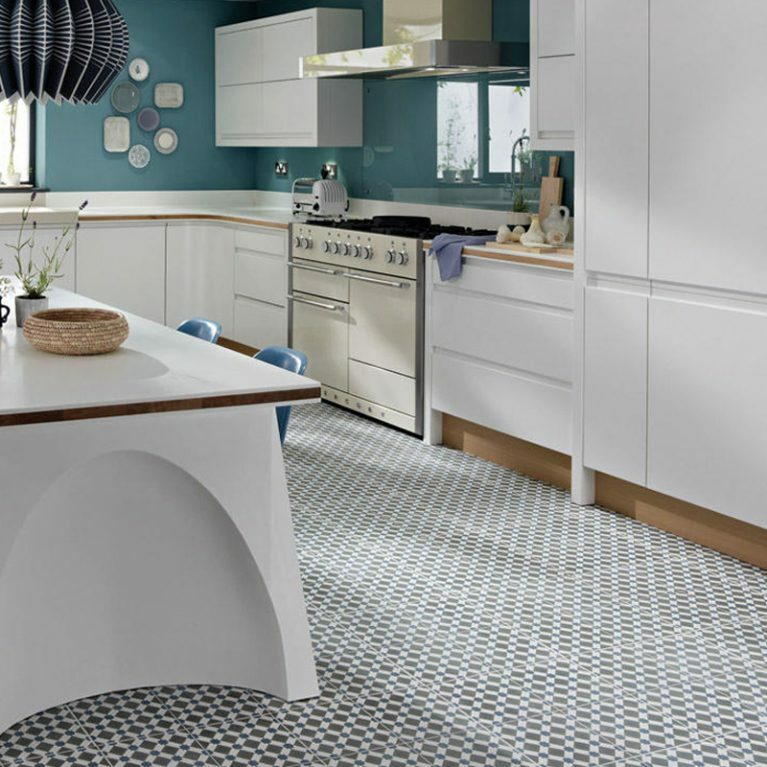 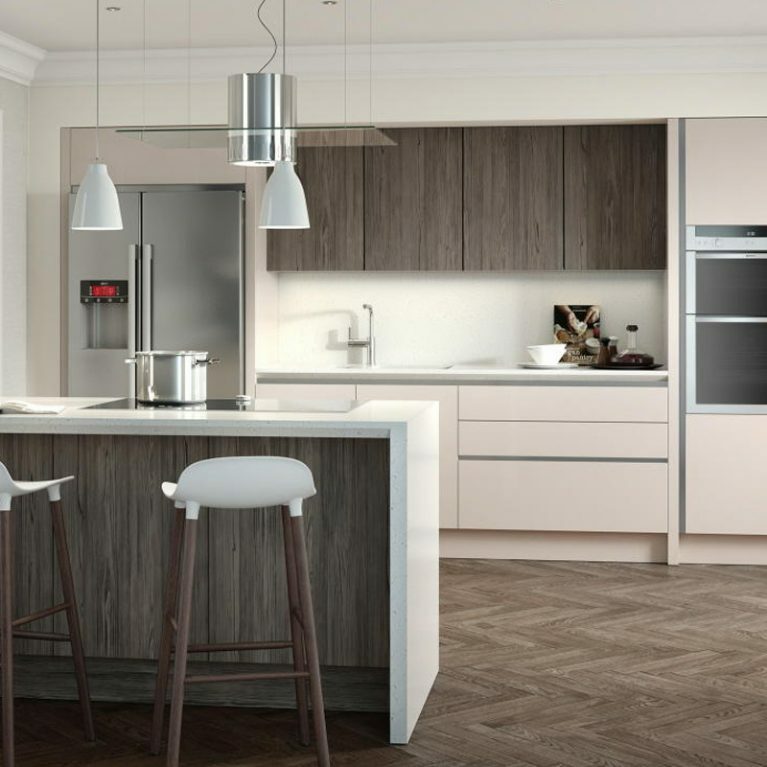 You’ll be blown away with the amount of space you have with the Milton Oak kitchen, helping you to keep the heart of your home clean and free of clutter at all times. 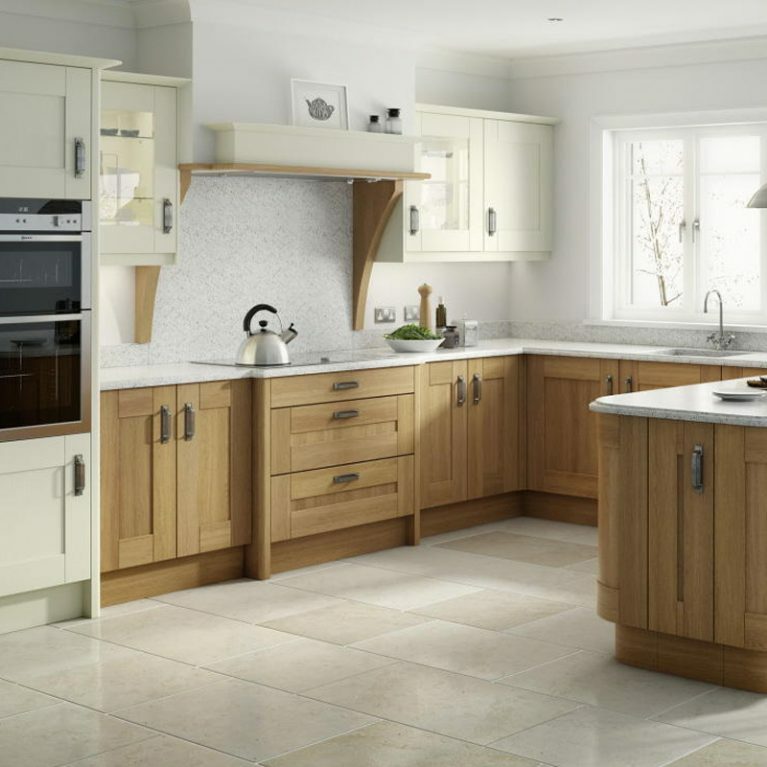 Taking an in-frame kitchen design to the modern world, your Milton Oak classic curved wood kitchen is completely customisable, allowing you to create your dream kitchen to fit whatever space you have. 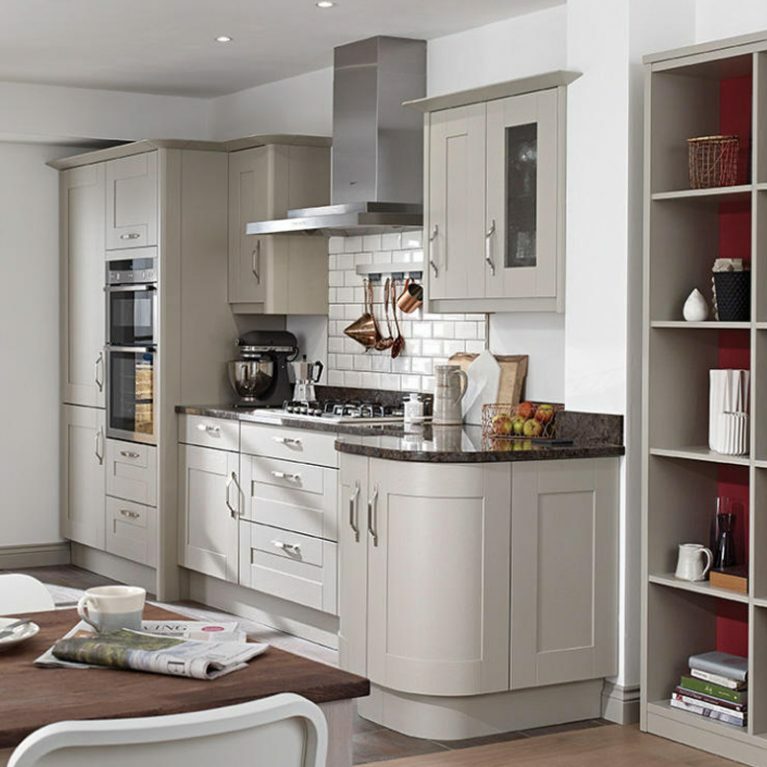 There are a number of different cupboard options as well as additional storage extras, from kitchen islands to standalone high cupboards. 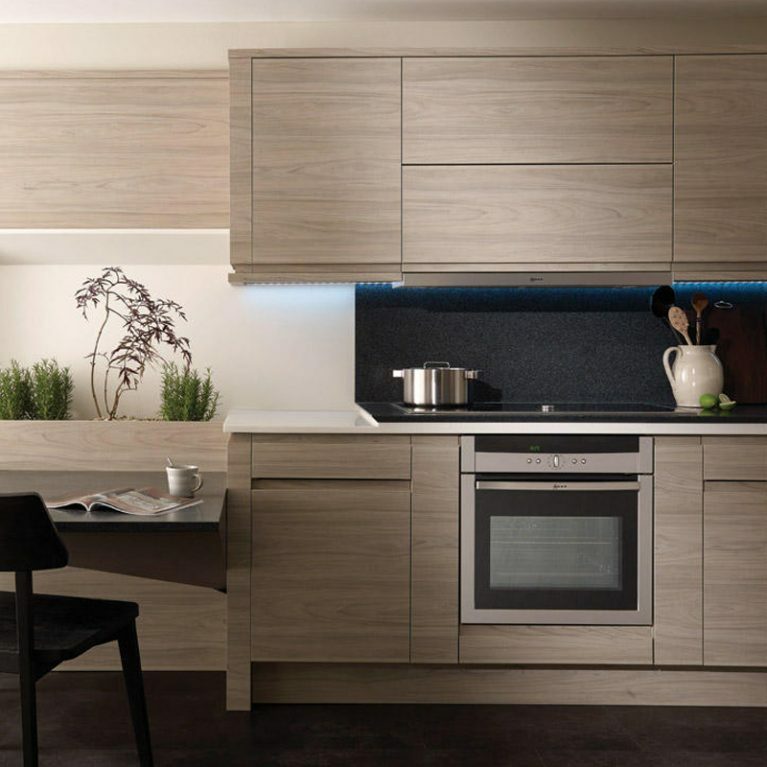 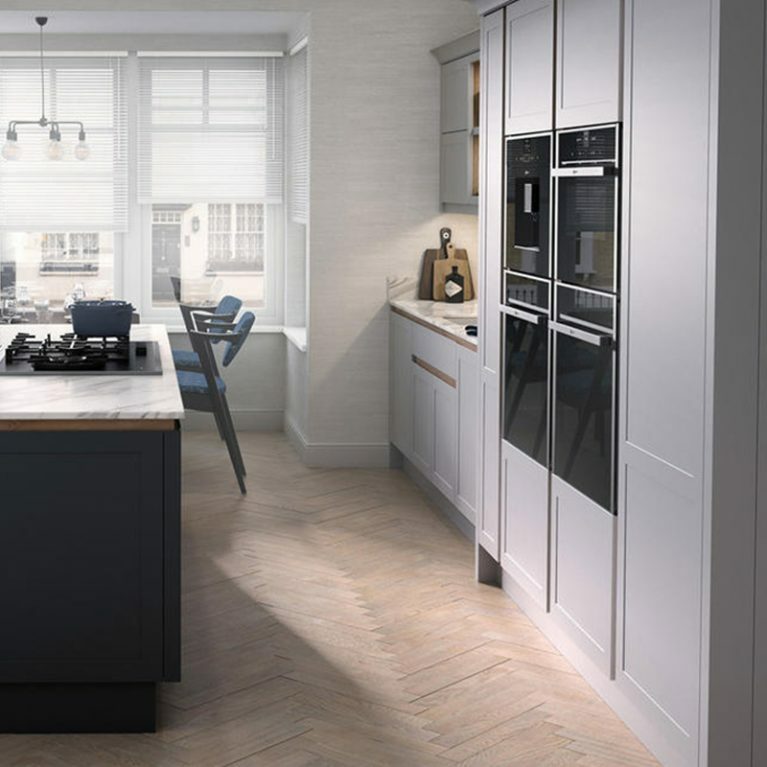 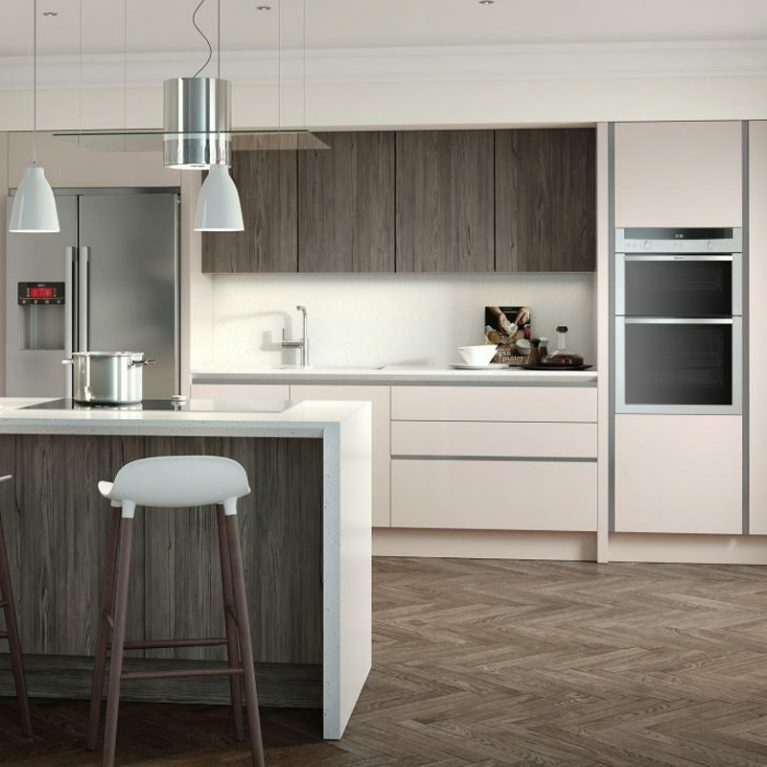 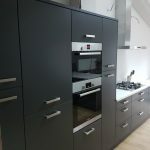 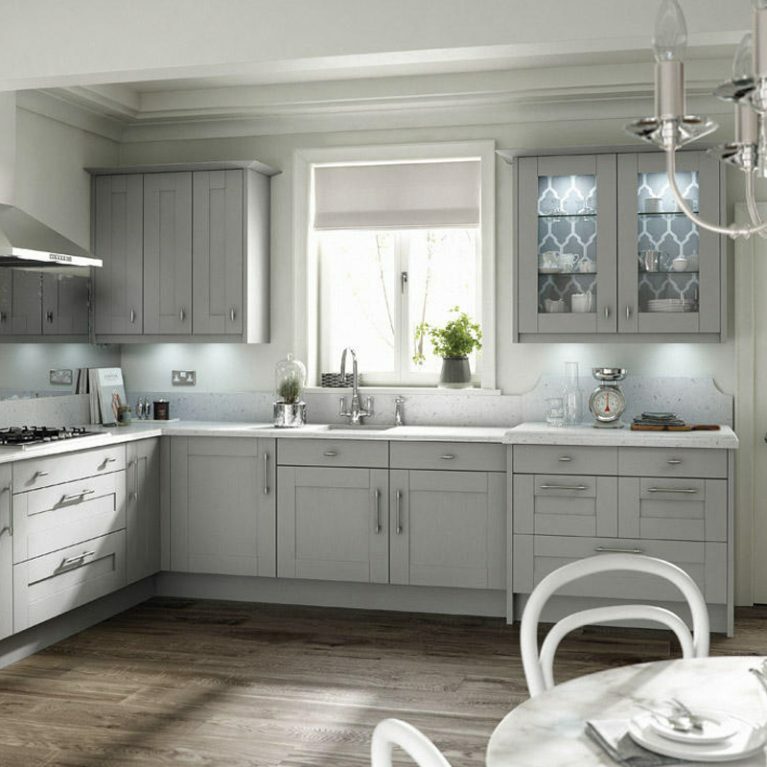 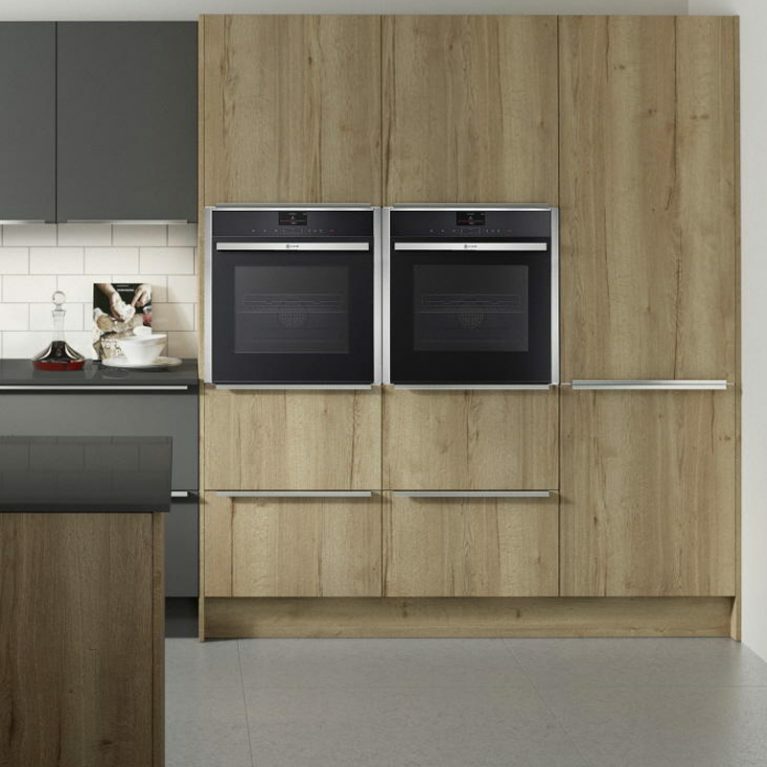 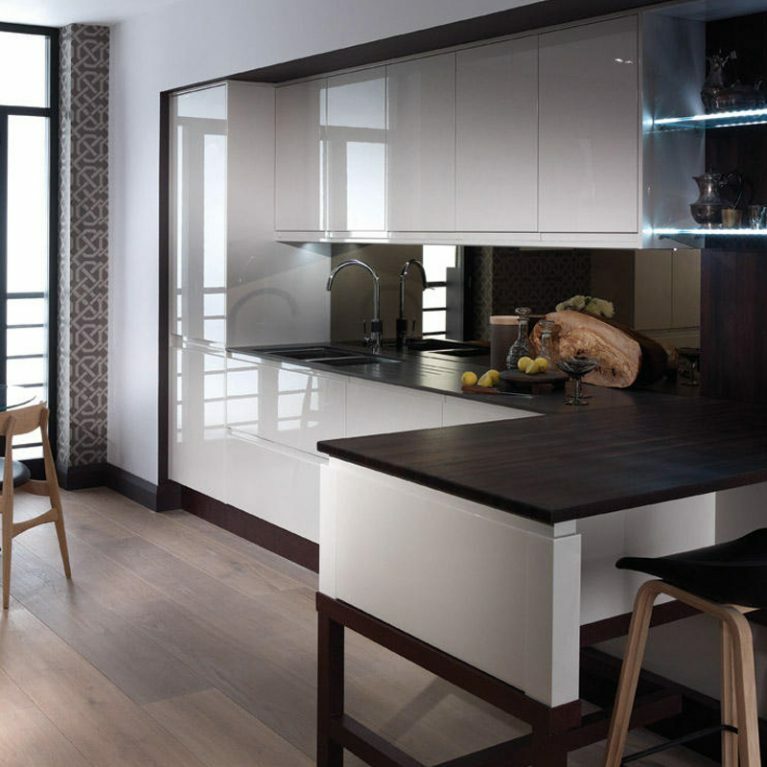 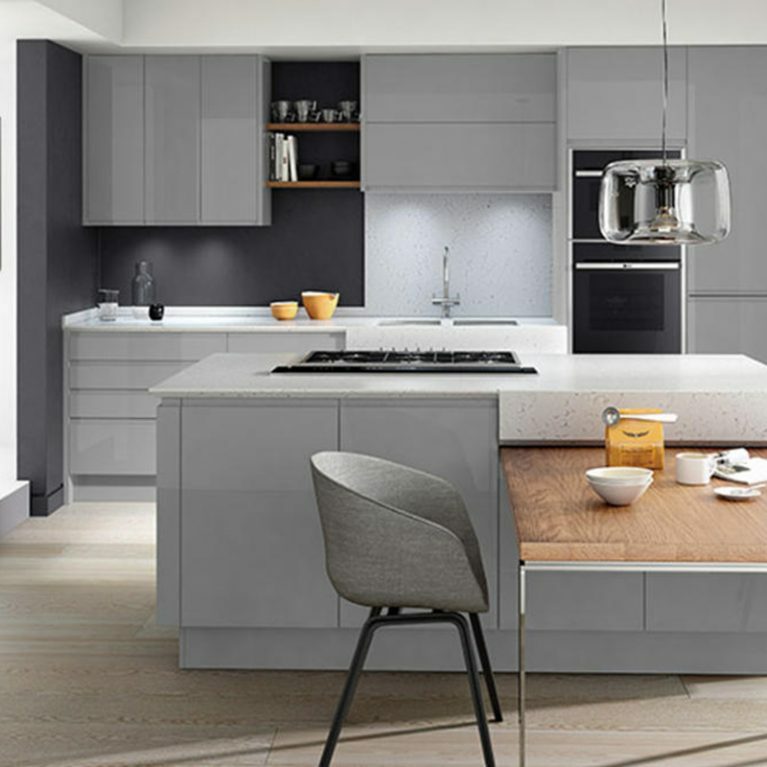 You’ll also find dressers and a range of different cupboard door finishes, from solid oak doors to glass feature doors which will allow you to show off your favourite kitchen accessories in style. 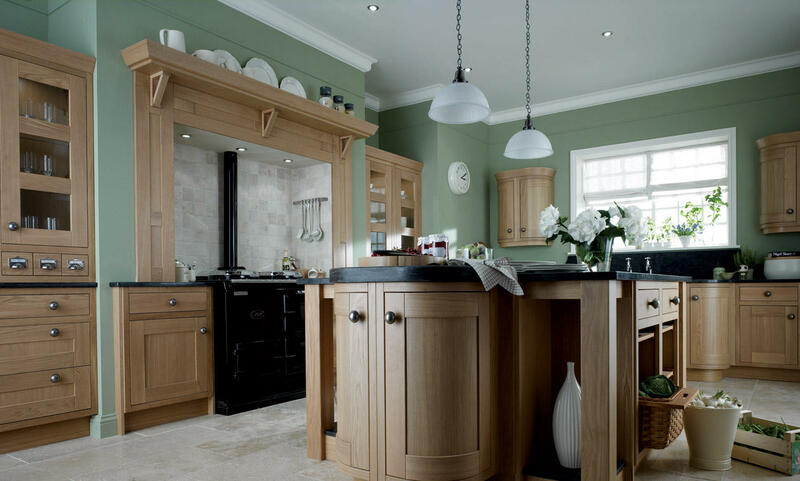 Pictured is a Milton Oak classic curved wood kitchen design with a round pewter door knob, which is a nod to a more classic kitchen design. 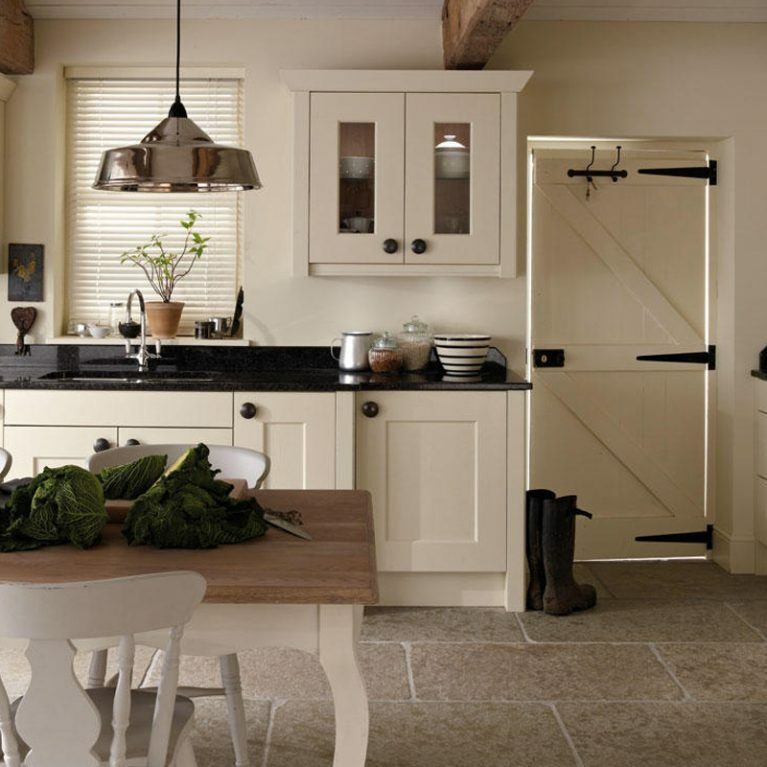 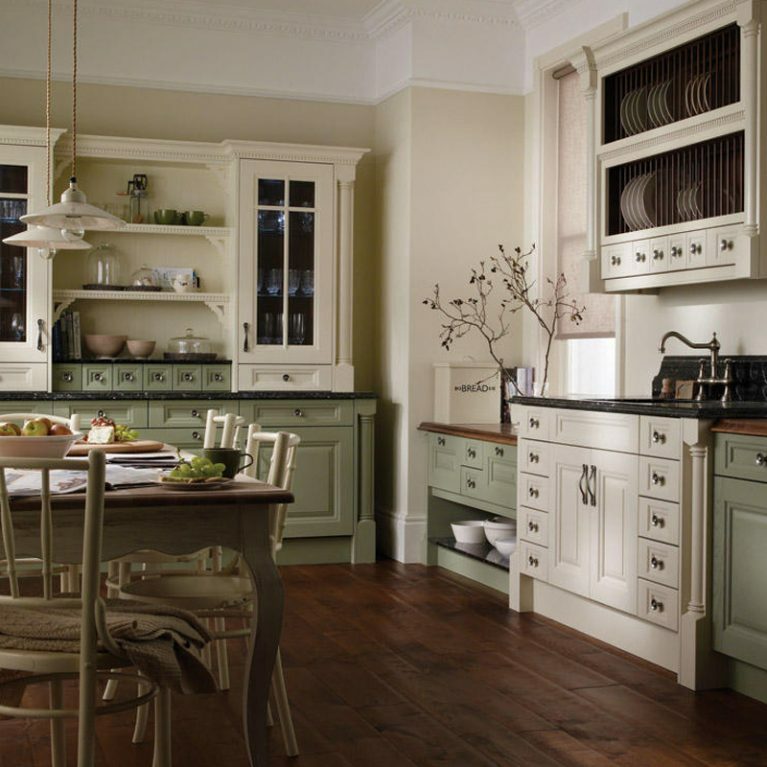 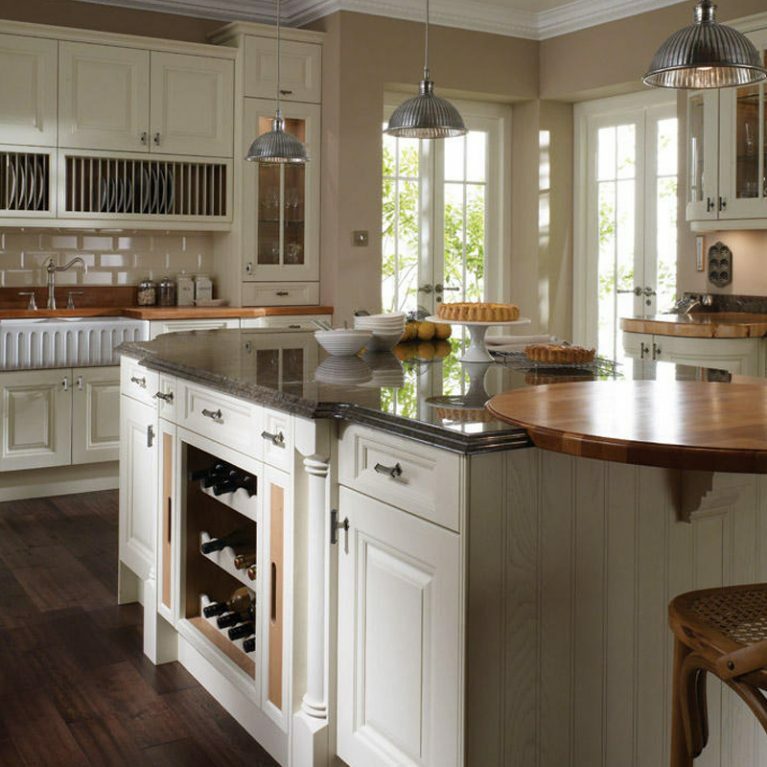 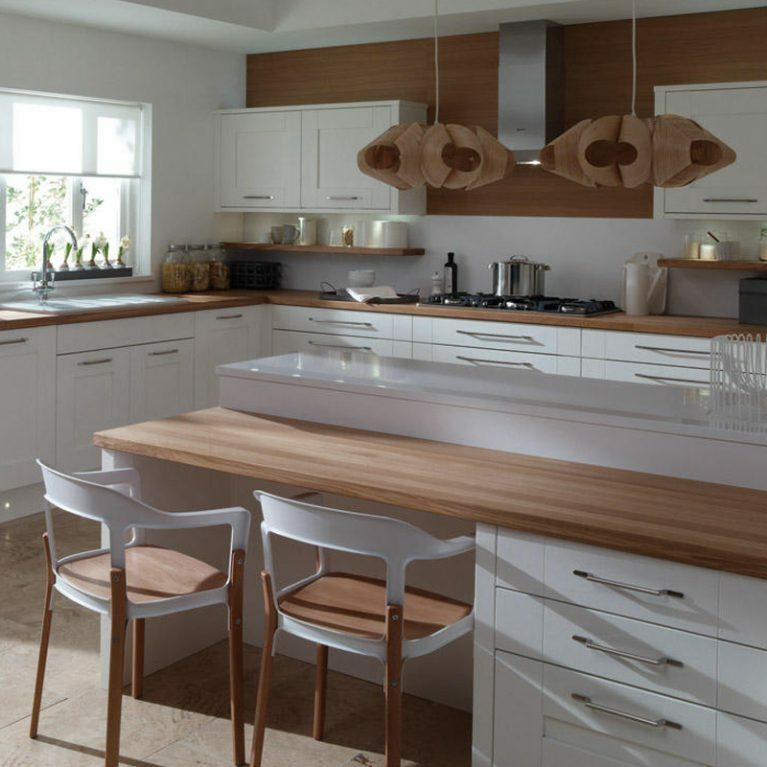 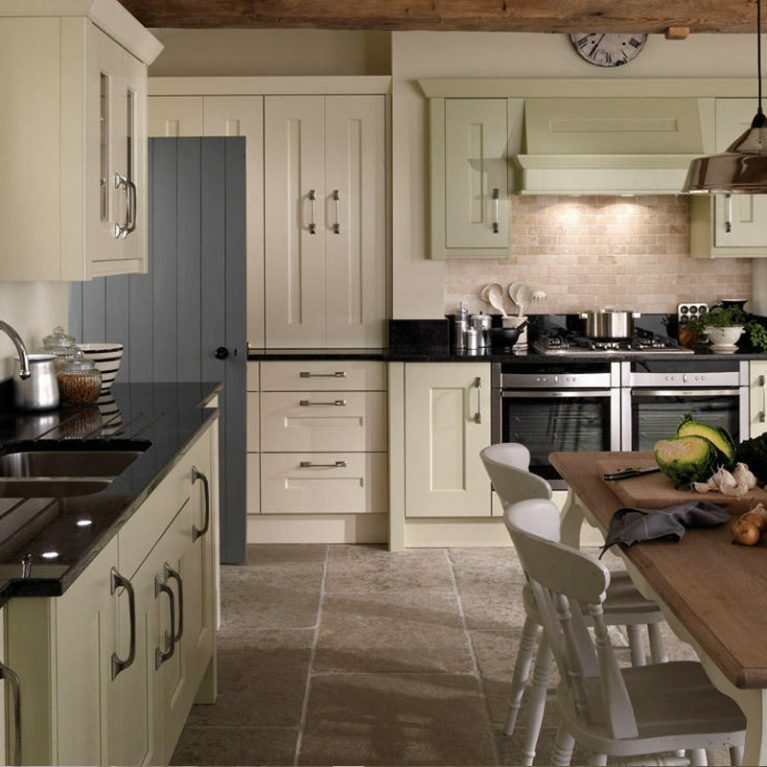 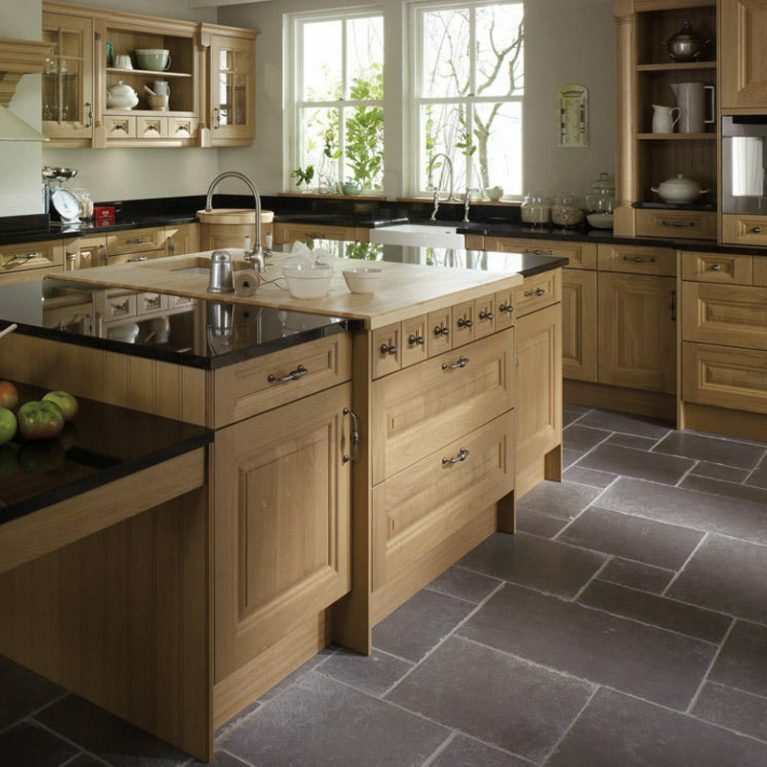 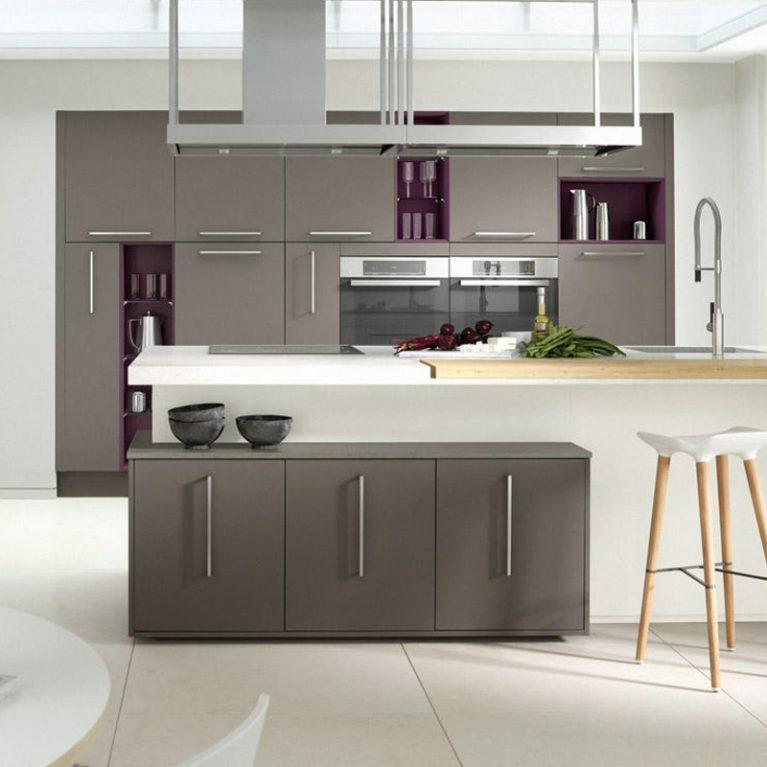 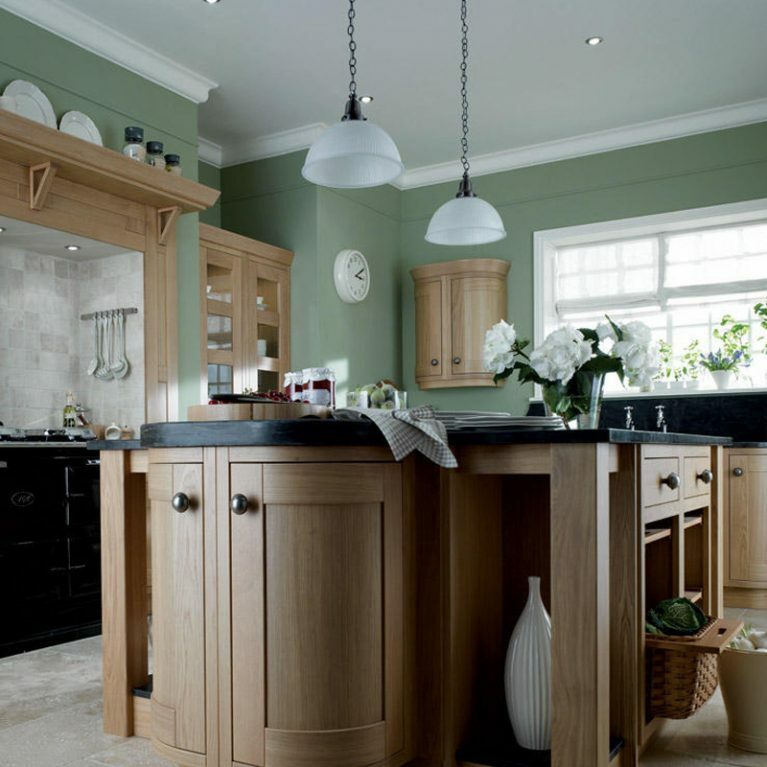 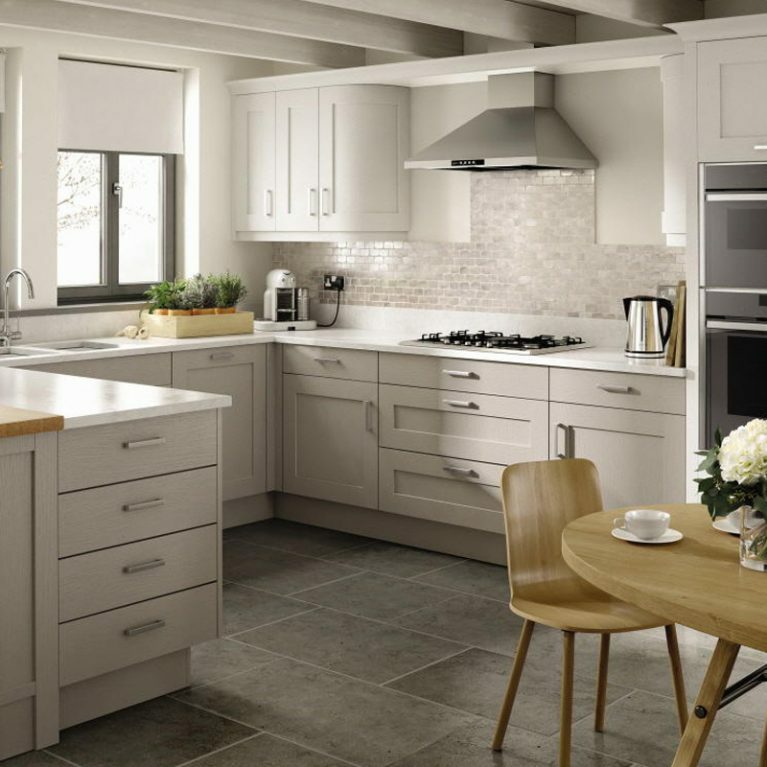 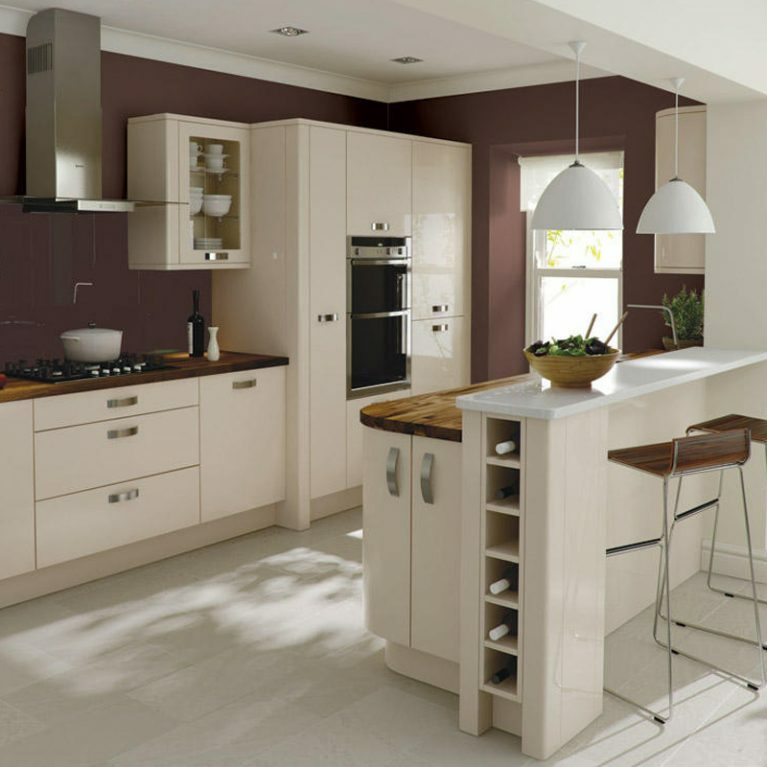 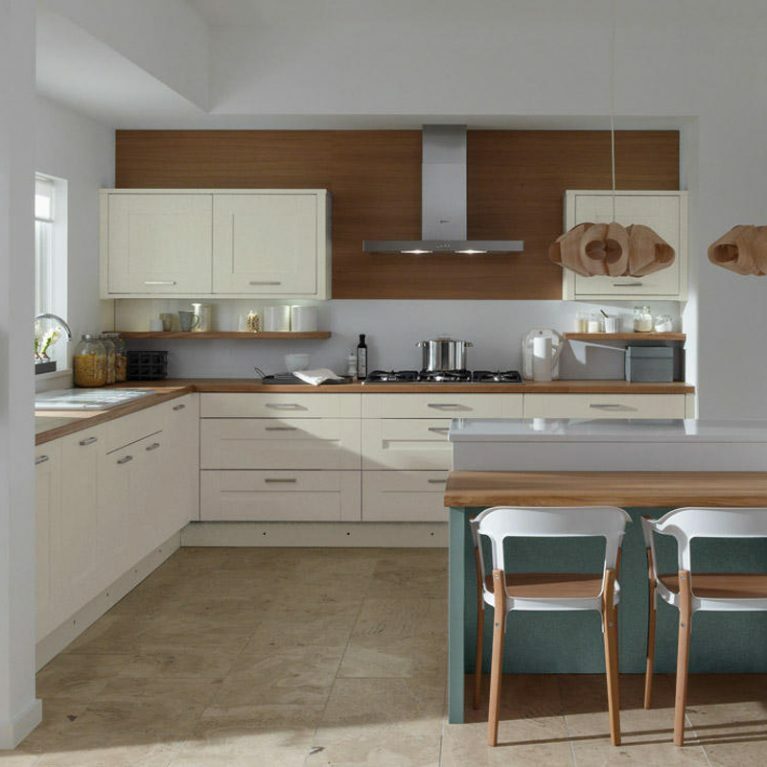 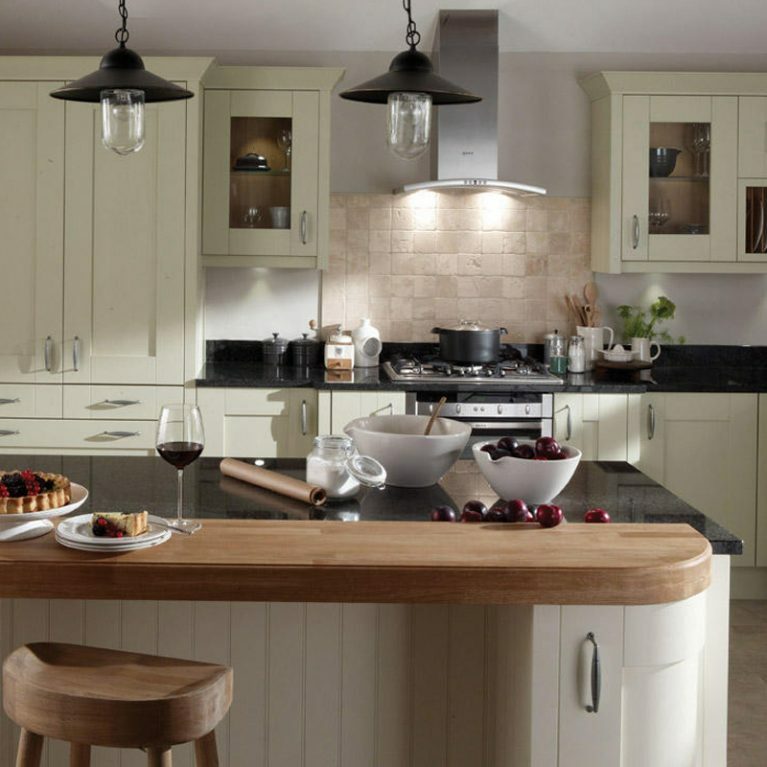 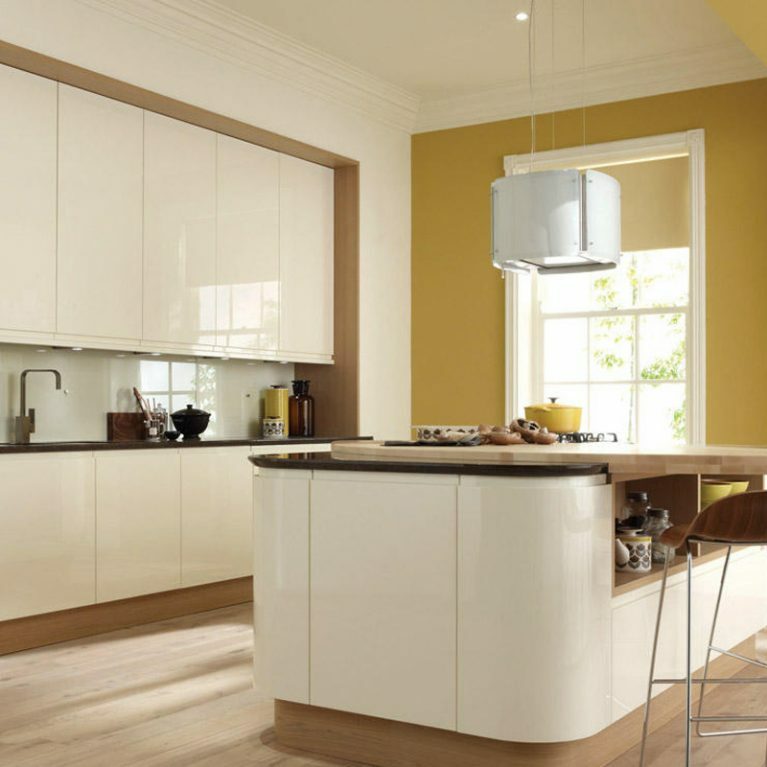 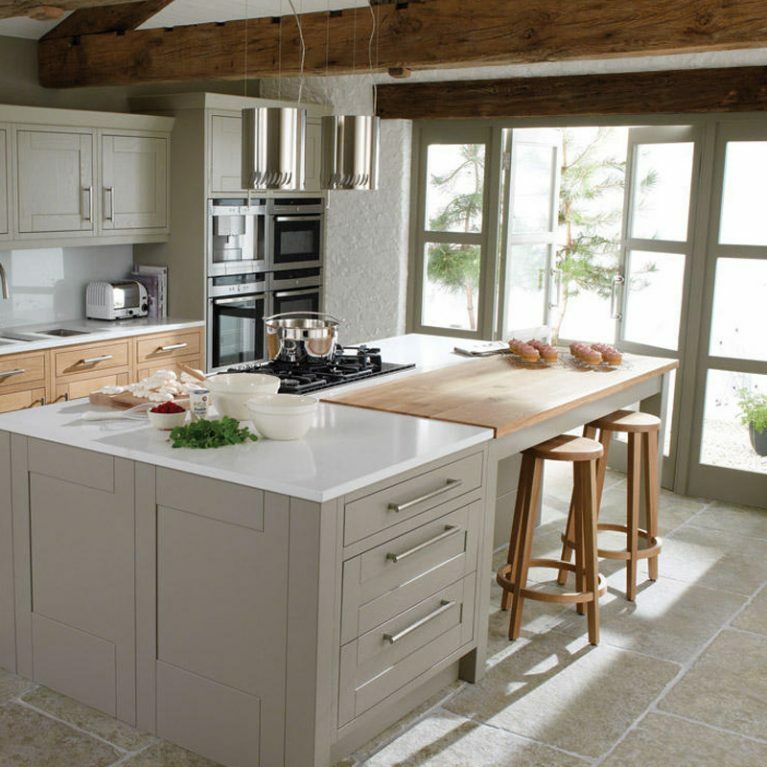 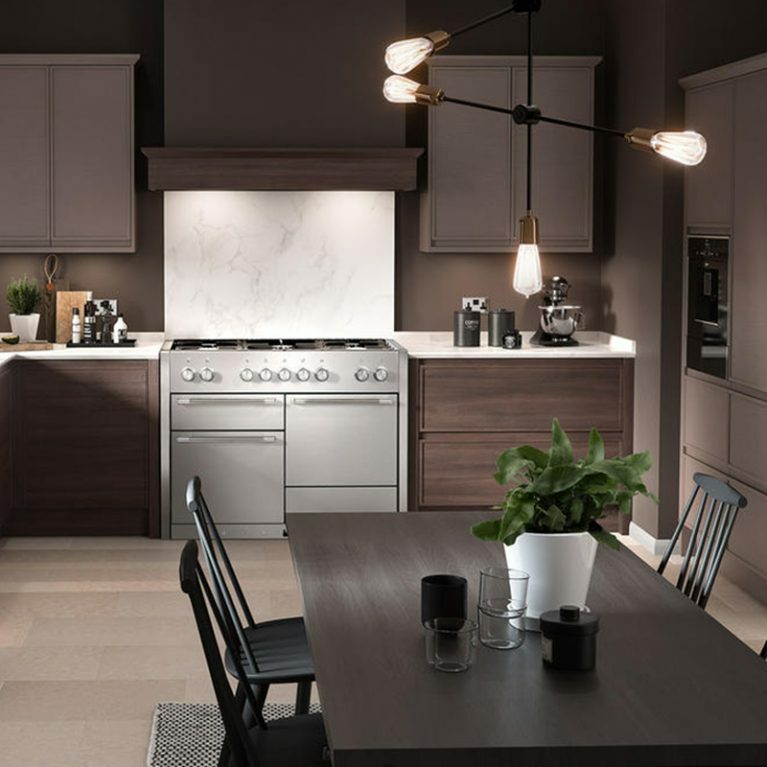 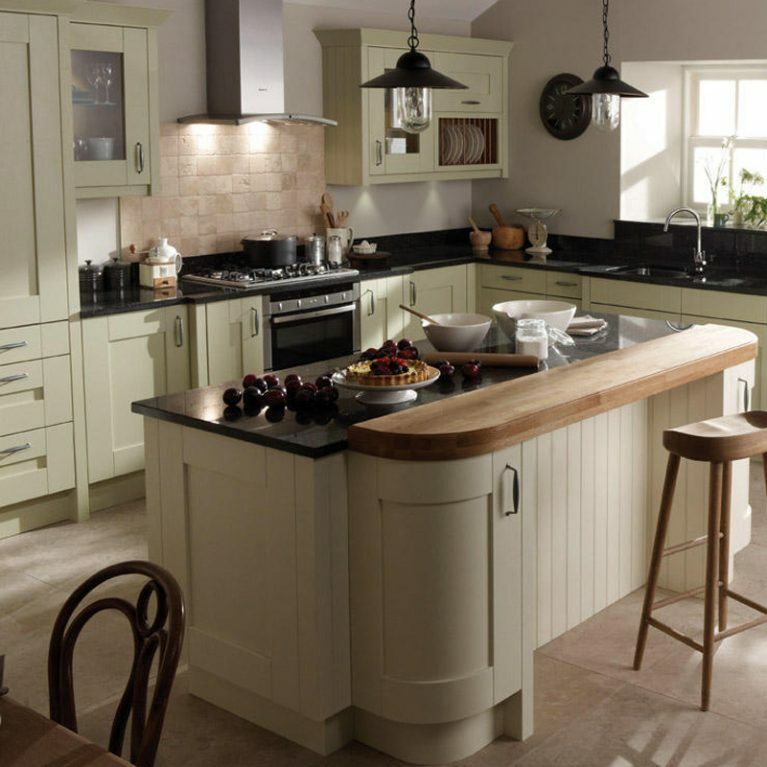 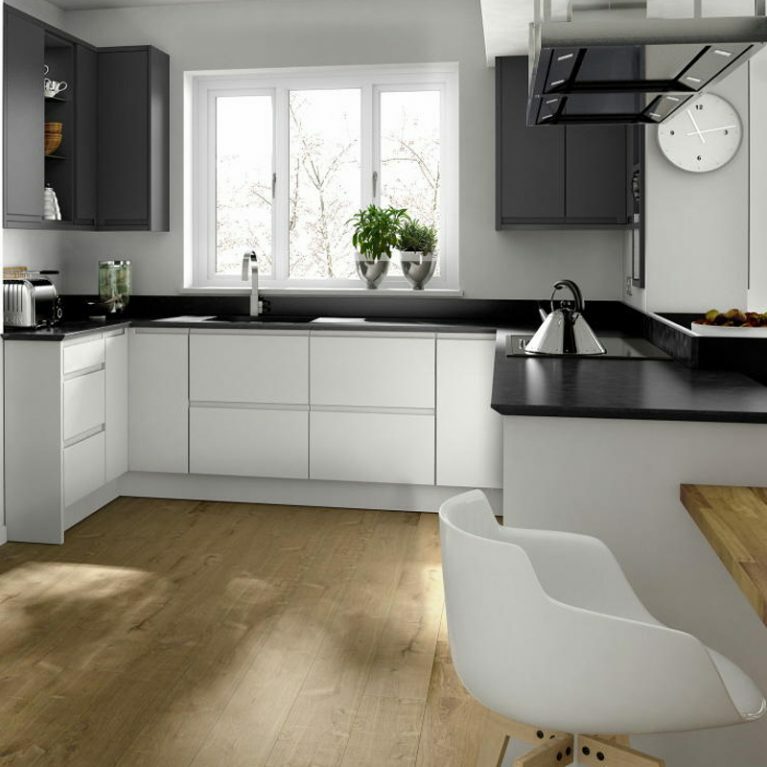 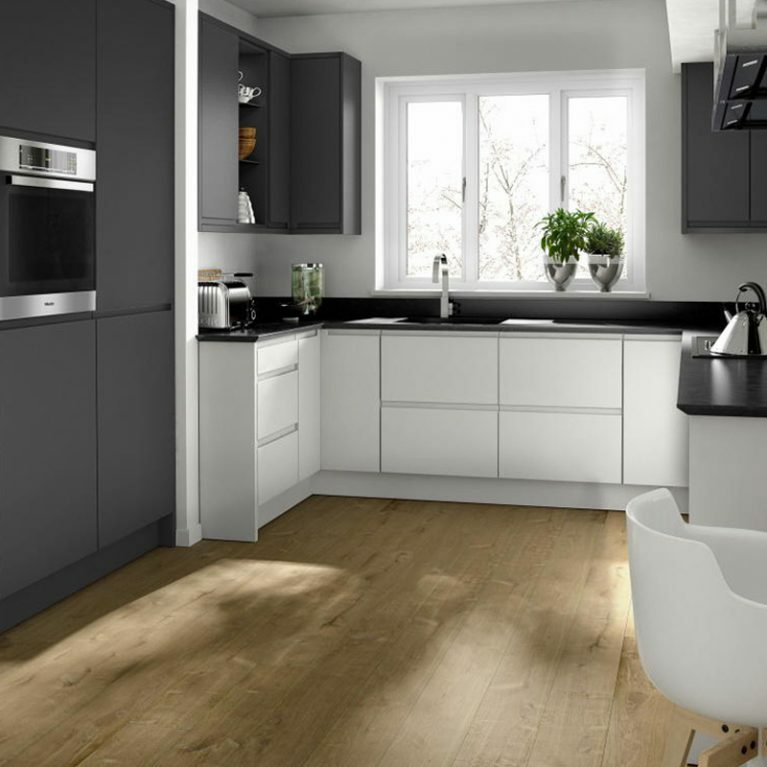 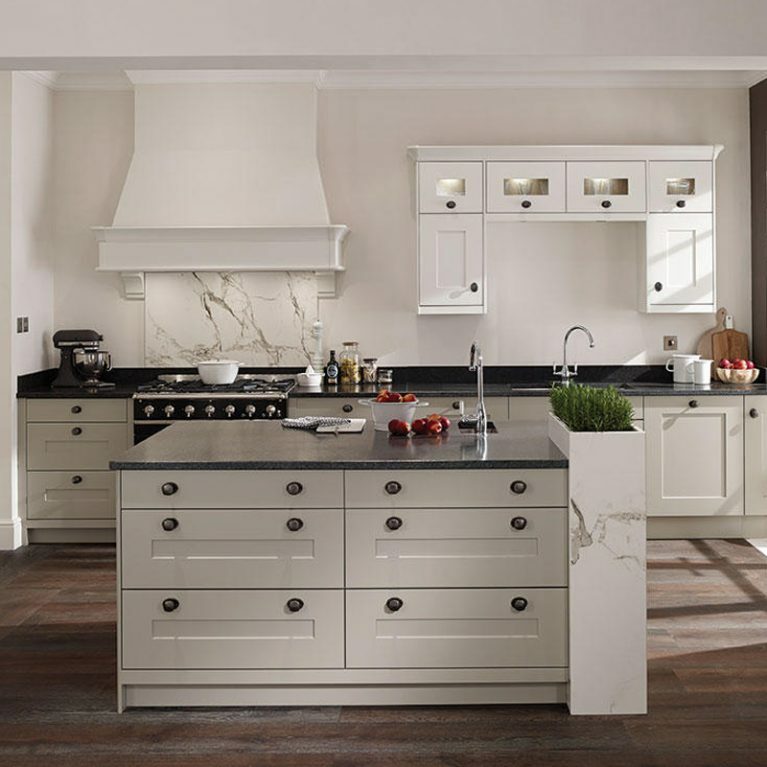 There are 27 different matte paint shades available for you to choose from when it comes to designing your Milton Oak kitchen, which means you can be as creative as you like when it comes to colour scheme, or stick to the classics to compliment the gorgeous oak foundation of this Milton kitchen. 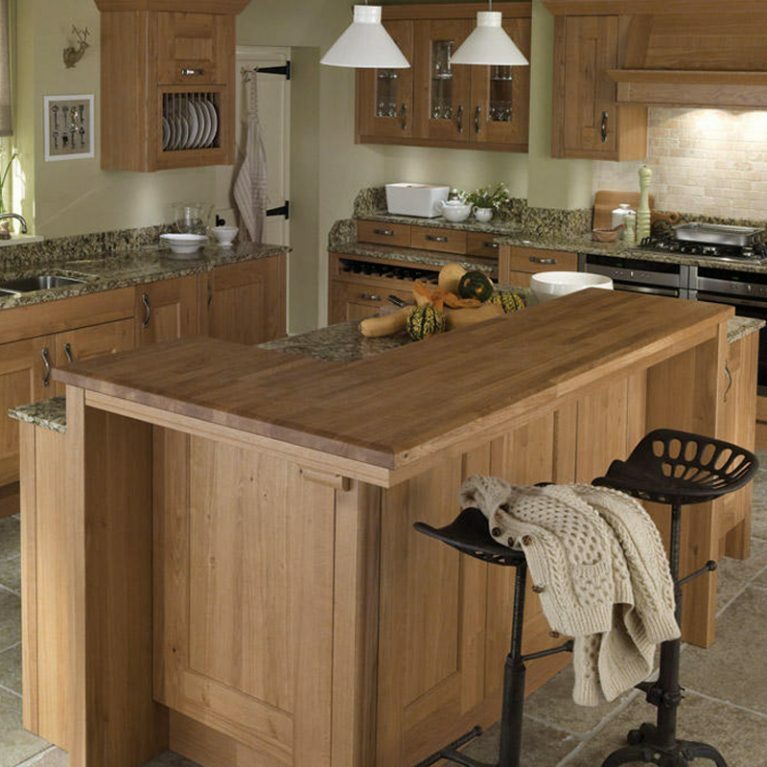 Adding a contrasting work surface to your Milton Oak classic curved wood kitchen not only creates a visually pleasing result, but offers a fabulous surface for food preparation and entertaining. 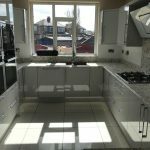 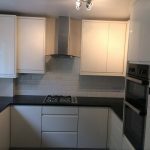 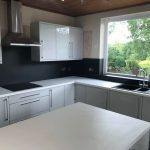 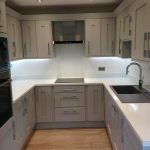 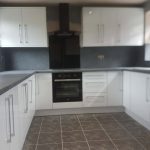 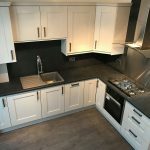 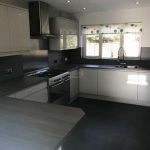 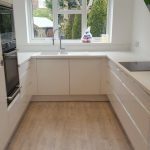 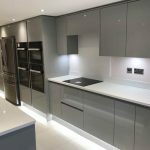 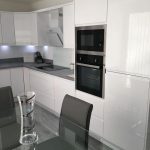 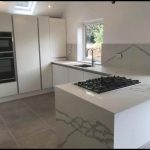 You can choose which material and finish you’d like for your work surface, opting perhaps for a contrasting dark shade as pictured, or something more neutral for a seamless and slick end result.